Being a lifelong fan of George Lucas and the Tuskegee Airmen, I was disappointed with the theatrical cut of this film - finding inconsistencies with the tone and choices made in regard to the editing. Frankly the theatrical cut felt like an assembly of all of the scenes filmed during production without that final editorial pass to restructure, recut and disregard the parts that are just standing in the way of what the movie really is. 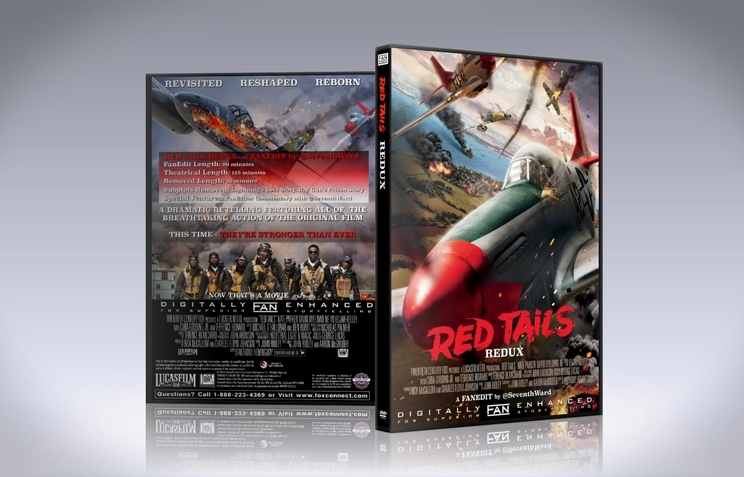 It's my intention with Red Tails Redux to give the film that final editorial pass - and by doing so make the movie more consistent with honoring the Tuskegee Airmen rather than exploiting their story for the sake of awe-inspiring visual effects. Retail blu-ray ripped and transcoded to ProRes422, edited in Final Cut Pro 6, mixed in Soundtrack Pro. I originally planned to see this when it cam out but due to poor reviews I gave it a miss. Now having seen it for the first time and not knowing the original I was very impressed. I didn't notice any changes or any hard cuts or evidence that it was an edited film and the story flowed well and I enjoyed it as a straight up WW2 film without any extra fluff added in. The only thing that prevented a perfect 10 was the music, maybe this was added or was original, but I felt the techno mix distracting and inappropriate for period piece movies like this. But maybe that was a Lucas original. Also I would love to see a list of complete changes in the changelog too. A great edit and I look forward to seeing what other films you're going to tackle. Watched this with my wife and son, neither of which have seen the original. At the end they had no idea they had just watched a fanedit. The pacing is superb and the story does not feel like anything is missing. Without a doubt this is the film as it should have been made, no time wasting sub-plots and completely focused on the pilots. This is definitely now my go to version. Excellent work SeventhWard I look forward to your future edits. WOW is all i can say about this edit. this is what fan editing is all about, making a bad movie an awesome one. i love this movie now (i hated the original). SeventhWard has cut all the dragged out sub plots and baggage this movie carried, making an awesome fun movie that we should have got originally. i could not give enough praise for this fan edit.anybody after a fun highly entertaining WW2 movie should check this out. PQ: good but will be getting the DVD. Editing: perfect i was so engrossed in the movie i did not notice any hard cuts or audio pops. Entertainment: highly entertained its a must see. 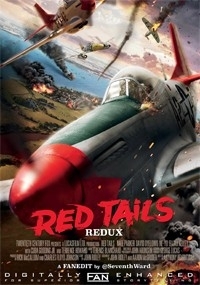 The theatrical release of Red Tails was, to me...disappointing. You would think that the world's richest independent filmmaker would be able to at least do a good job with his own swan song vanity project. The original version was disjointed, cliche ridden and beat you over the head with its morality. Sadly, Lucas dropped the ball yet again--Fortunately, SeventhWard grabbed the ball, cleaned it up, and ran it in for a touchdown. This is the movie that Lucas should have made. Suddenly, I was emotionally invested in the characters, something which simply did not happen during my original viewing. The action scenes put punctuation to the dramatic elements, instead of trying to carry the movie. Red Tails is as deep as saran wrap and as subtle as a mallet. It's George Lucas's love letter to WWII movies like Sergeant York that are exercises in myth building and mild propaganda. No doubt the real life story was a lot more interesting than the breakfast cereal version we get in Red Tails. What kind of fanedit is possible starting with that? A fine one, it turns out. Red Tails Redux is fine work because the editor knew exactly what his target was and went straight to it like a heat seeking missile. The best part of the story is the friendship at the center, so strip away everything that doesn't contribute. Change up the scene order and dialogue to make the audience care more about those characters. Whole subplots disappear without a trace. Preachy and groan worthy dialogue is beaten back. The end product is enjoyable, quick paced and even gripping at times. What's most impressive is how the fanedit pays attention to the whole structure in a way that not many fanedits do. Rearranged scenes do a better job of building the emotional investment. And they give the movie a new rhythm. Now when you watch the spectacular dogfights it's more than great eye candy, you have a sharper concern for the pilots. Technically speaking the cuts, dissolves, new music, and a little bit of new footage flow without a hitch. There's no sense that big chunks of the movie have been chopped out. The viewing experience is much better for it and without the digressions and preachiness the movie zooms like a P-51 Mustang.